Ph.D. candidate Ajay V. Singh with the results of a vertical wall test that shows the effects of a burning fuel's temperature gradient. A new modeling technique developed at the University of Maryland could expand how we describe and predict the way materials burn under a variety of conditions, says Department of Mechanical Engineering (ME) Ph.D. candidate Ajay V. Singh. Singh was recently honored by the Combustion Institute for his paper on the model, which he created and tested in the Department of Fire Protection Engineering (FPE). The model describes a relationship between the change in temperature above a burning fuel, known as a temperature gradient, and the fuel’s mass burning rate, the rate at which it is consumed at its surface. Complemented by a new experimental methodology, the technique provides an unobtrusive means to understand what is happening on the surface of a burning fuel by measuring changes in the thin region between the fuel and flames. Until now, realistic models of the burning behavior of condensed-phase (solid or liquid) fuels have been incomplete due the complex interactions that occur at the interface where the fuel transforms from its original state to a gaseous state as it burns, Singh explains. Traditionally, the average burning rate of a fuel has been calculated by weighing a sample, burning it, then weighing what’s left and scaling that information up to different volumes and areas. Numerous universally accepted computer models exist for a variety of fuels based on this experimental data. While this tells us what happens on a global scale, says Singh, it does not describe the flame’s behavior at the local, surface level of the fuel, or the changes that occur over the distance between its origin and where it tapers off. Numerical models of local burning phenomena exist, but remain unvalidated by physical experimental data. This is most often due to a lack of instrumentation able to record and report what is happening in real time by taking measurements from the standoff region between a flame and a burning fuel sample. Singh and his colleagues first tested their model on data from multiple published studies. “When we applied our new expression to some existing detailed burning rate measurements and temperature profiles, we found that our prediction came very close to what the researchers who produced the data actually got,” says Singh. The model worked so well that he began to wonder if he’d missed something, so he turned his attention to designing new physical experiments whose data he could use for additional tests. He and his team started with liquid fuel, which burns very stably, in vertical wall tests. When those proved successful he decided to try something more difficult: solid fuel, both with and without varying levels of airflow. “When a solid fuel burns, it will recede in thickness as it vaporizes and is consumed by the flame,” Singh explains. But, he adds, it burns unevenly. At the ignition site, burning is most intense, then goes down by degrees across the surface of the sample, creating an uneven surface that is difficult to accurately measure. Using a novel experimental setup, Singh focused on the fuel’s gaseous phase instead of its solid phase, measuring the flame close to the fuel surface. He was able to demonstrate for the first time how to measure what was happening across the entire surface of a fuel sample. Previous data only reported averages for the surface of the fuel sample. 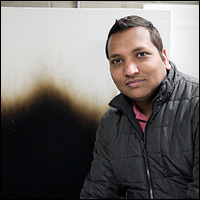 While the model has so far only been applied to smaller, laminar flames, Singh and his colleagues plan to study whether it can be applied to sooty fuels under larger, turbulent burning conditions, and the effect of charring materials on the relationship between a fuel’s local burning rate and its temperature gradient. Singh’s paper, “Estimation of local mass burning rates for steady laminar boundary layer diffusion flames,” will be available for download without a subscription on ScienceDirect during the month of February 2015. The paper is also in contention for the Combustion Institute’s Silver Combustion Medal, which will be awarded at its next international symposium in Seoul, South Korea in August 2016. Singh’s research was sponsored by the Minta Martin Foundation at the University of Maryland. See Proceedings of the Combustion Institute, Volume 35, Issue 3, 2015, pages 2527–2534.